Author Thomas King, who wrote this year’s One Book One Northwestern selection, speaks at Fisk Hall on Wednesday. King took questions from the audience and from Medill Prof. Loren Ghiglione, who moderated the event. 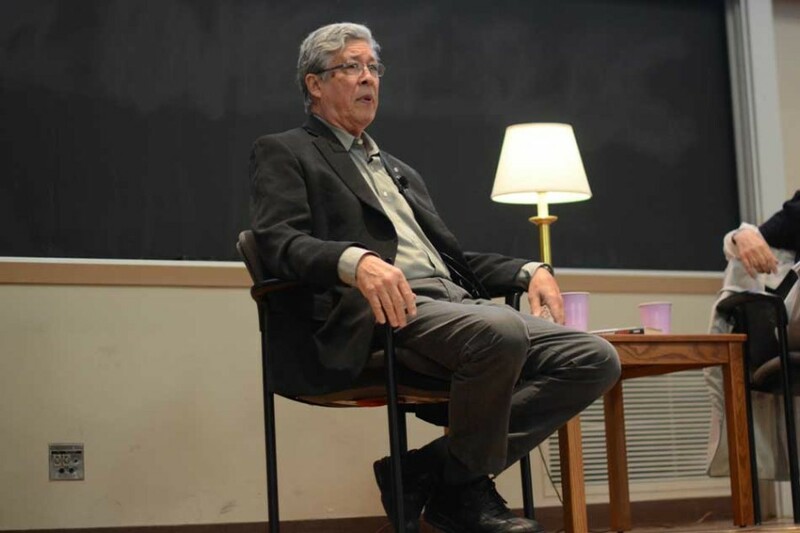 One Book One Northwestern author Thomas King discussed his love of storytelling, his use of humor in writing and his views on the future for Native American people on Wednesday in Fisk Hall. King, a Canadian author and activist, wrote “The Inconvenient Indian: A Curious Account of Native People in North America,” the One Book selection for the 2015-16 academic year. The book examines the troubling relationship between white and native people throughout American and Canadian history. The book was selected following a recommendation by the Native American Outreach and Inclusion Task Force last November that this year’s book cover genocide or colonialism. King said growing up with the stigma of being raised by a single mother drew him to storytelling. “Because (I) held a kind of marginalized place in the community which I didn’t care much for, I tried to create stories that made me seem better than I really was,” he said to a crowd of more than 200 people. King said he learned how humor can help people discuss difficult issues as a counselor for native students at the University of Utah in the 1960s and 70s. Medill Prof. Loren Ghiglione, this year’s One Book faculty chair, moderated the event and asked King if he felt optimistic about what the future holds for Native Americans in the United States and Canada. King pointed to British Columbia, where members of tribes are squabbling over land with supporters of the Keystone Pipeline. King did not address how he thinks the University should treat John Evans, one of the University’s founders. Evans was the governor of the Colorado during the Sand Creek Massacre in 1864, in which U.S. soldiers attacked a Cheyenne and Arapaho encampment and killed about 150 people, most of them women and children. However, the University’s John Evans Study Committee concluded he was not directly involved in the massacre, though NU ignored his moral failures both before and after the Sand Creek. Ghiglione said facilitating a campus-wide discussion about Evans is one of One Book’s programming goals for this year. Many Evanston residents attended the event, One Book fellow Melody Song said.